The IGBT device has proved to be a highly important Power Semiconductor, providing the basis for adjustable speed motor drives (used in air conditioning and refrigeration and railway locomotives), electronic ignition systems for gasolinepowered motor vehicles and energy-saving compact fluorescent light bulbs. Recent applications include plasma displays (flat-screen TVs) and electric power transmission systems, alternative energy systems and energy storage. This book is the first available to cover the applications of the IGBT, and provide the essential information needed by applications engineers to design new products using the device, in sectors including consumer, industrial, lighting, transportation, medical and renewable energy. The author, B. Jayant Baliga, invented the IGBT in 1980 while working for GE. His book will unlock IGBT for a new generation of engineering applications, making it essential reading for a wide audience of electrical engineers and design engineers, as well as an important publication for semiconductor specialists. Essential design information for applications engineers utilizing IGBTs in the consumer, industrial, lighting, transportation, medical and renewable energy sectors. Readers will learn the methodology for the design of IGBT chips including edge terminations, cell topologies, gate layouts, and integrated current sensors. 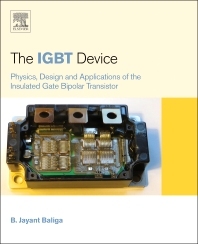 The first book to cover applications of the IGBT, a device manufactured around the world by more than a dozen companies with sales exceeding $5 Billion; written by the inventor of the device. Applications engineers working in the consumer, industrial, transportation, lighting, medical, and renewable energy sectors; Electrical Engineers involved with the control and management of electrical power and semiconductor device technology; Semiconductor specialists. Professor Baliga obtained his Bachelor of Technology degree in 1969 from the Indian Institute of Technology, Madras, India. He was the recipient of the Philips India Medal and the Special Merit Medal (as Valedictorian) at I.I.T, Madras. He obtained his Masters and Ph.D. degrees from Rensselaer Polytechnic Institute, Troy, NY, in 1971 and 1974, respectively. His thesis work involved Gallium Arsenide diffusion mechanisms and pioneering work on the growth of InAs and GaInAs layers using Organometallic CVD techniques. At R.P.I., he was the recipient of the IBM Fellowship in 1972 and the Allen B. Dumont Prize in 1974. From 1974 to 1988, Dr. Baliga performed research and directed a group of 40 scientists at the General Electric Research and Development Center in Schenectady, NY, in the area of Power Semiconductor Devices and High Voltage Integrated Circuits. During this time, he pioneered the concept of combining MOS and Bipolar physics to create a new family of discrete devices. He is the inventor of the IGBT which is now in production by many International Semiconductor companies. For his work, Scientific American Magazine named him one of the ‘Eight heroes of the semiconductor revolution’ in their 1997 special issue commemorating the Solid-State Century. Dr. Baliga is also the originator of the concept of merging Schottky and p-n junction physics to create a new family of JBS power rectifiers that are commercially available from various companies. In August 1988, Dr. Baliga joined the faculty of the Department of Electrical and Computer Engineering at North Carolina State University, Raleigh, North Carolina, as a Full Professor. At NCSU, in 1991 he established an international center called the Power Semiconductor Research Center (PSRC) for research in the area of power semiconductor devices and high voltage integrated circuits, and has served as its Founding Director. In 1997, in recognition of his contributions to NCSU, he was given the highest university faculty rank of Distinguished University Professor of Electrical Engineering. In 2008, Professor Baliga was a key member of an NCSU team - partnered with four other universities - that was successful in being granted an Engineering Research Center from the National Science Foundation for the development of micro-grids that allow integration of renewable energy sources. Professor Baliga has received numerous awards in recognition for his contributions to semiconductor devices. These include two IR 100 awards (1983, 1984), the Dushman and Coolidge Awards at GE (1983), and being selected among the 100 Brightest Young Scientists in America by Science Digest Magazine (1984), and, on October 21, 2011, President Obama personally presented Dr. B. Jayant Baliga with the National Medal of Technology and Innovation, the highest form of recognition given by the United States Government to an Engineer, in a ceremony at the White House. Dr. Baliga’s award citation reads: For development and commercialization of the Insulated Gate Bipolar Transistor and other power semiconductor devices that are extensively used in transportation, lighting, medicine, defense, and renewable energy generation systems.